I know some of you are dying to see Divergent, the screen adaptation of the first in Veronica Roth's YA dystopian trilogy. I know some of you are dying to see Shailene Woodley as Tris, and I know some of you are dying to see Theo James as Four. And some of you are just dying to see the clothes. Costume designer Carlo Poggioli gave E the inside story on the clothing designs and the thinking that went into designing the looks for each faction. 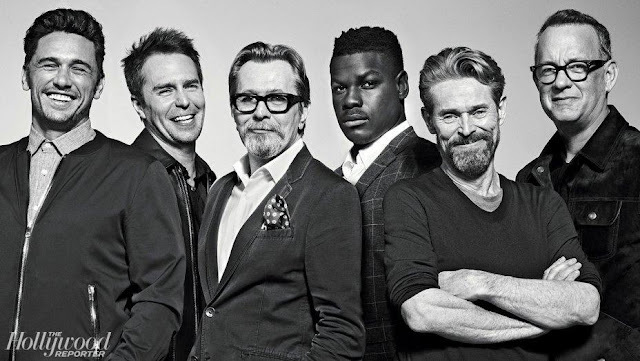 Poggioli has designed clothing for Romeo and Juliet,(the 2013 version starring Hailee Steinfeld)The Talented Mr.Ripley, Cold Mountain, The English Patient and a film MLH worked on, Abraham Lincoln: Vampire Hunter. First up, Tris and her brother Caleb (Ansel Elgort) look utterly dowdy in Abnegation. 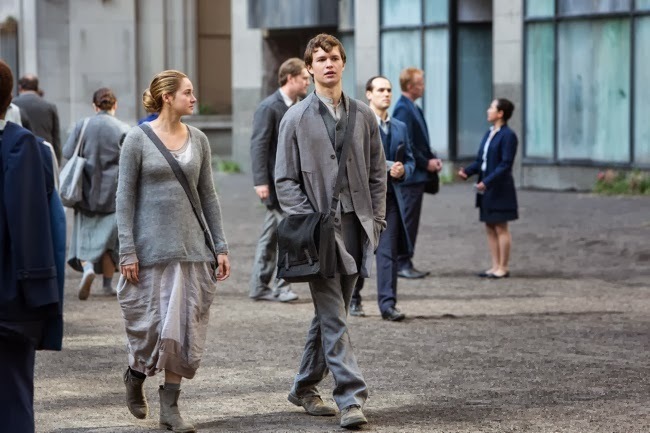 Abnegation: "The Abnegation faction puts other peoples needs in front of their own with no hesitation," explains Carlo. 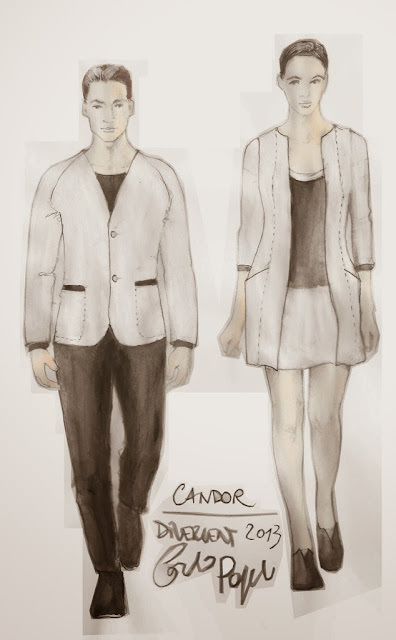 "The colors they wear are shades of grey, the fabrics are all natural fibers and very plain, like wool and cottons. And the cut of the clothes is very simple and rough," he says. 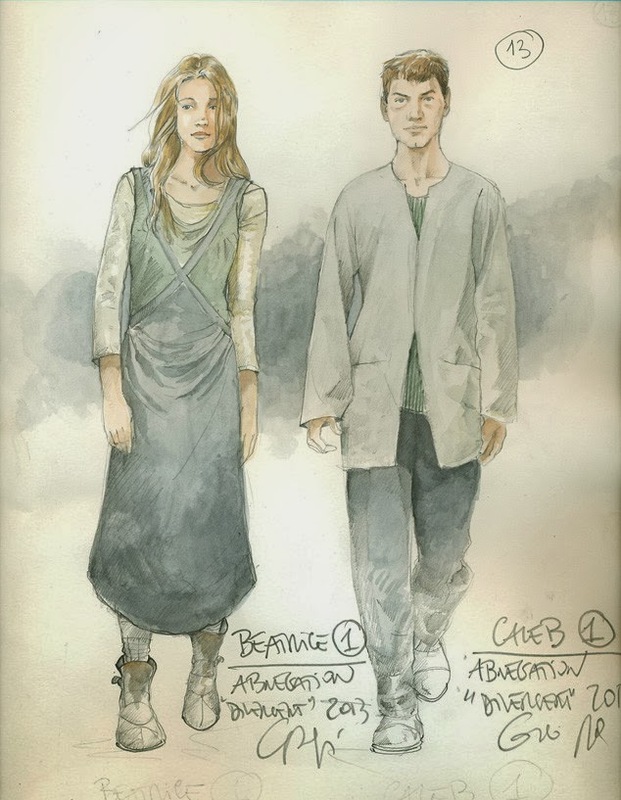 "Tris [played by Shailene], is born into Abnegation, and so she wears clumsy clothes. And throughout the story she becomes more sensual and confident after she hones her great abilities in the Dauntless faction, which is also reflected in her costume transformation." Dauntless: So who are the Dauntless, exactly? Carlo explains: "The faction of fearless protectors that face challenges head on are known as the Dauntless. The main colors are shades of black with some accents in orange, red, and purple (the color of the fire and flames) to distinguish the different ranks," says Carlo. "Orange and grey are for the newcomers, red for the Dauntless-born, and purple for the higher ranks (trainers such as Four, Eric and the lieutenants). The patterns are very functional with many pockets to contain the objects needed for the training (knifes, ammo, etc.) and all the fabrics for Dauntless were custom made." Erudite: "Science, intellect and curiosity form the basis and foundation for the Erudite faction," says Carlo. 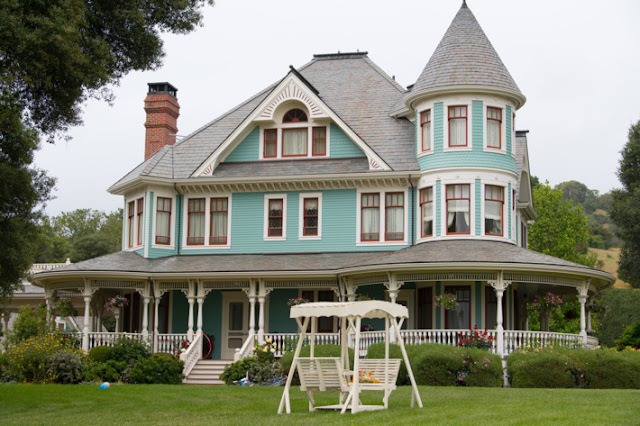 "They wear different shades of blue with some shadows of other cold colors. 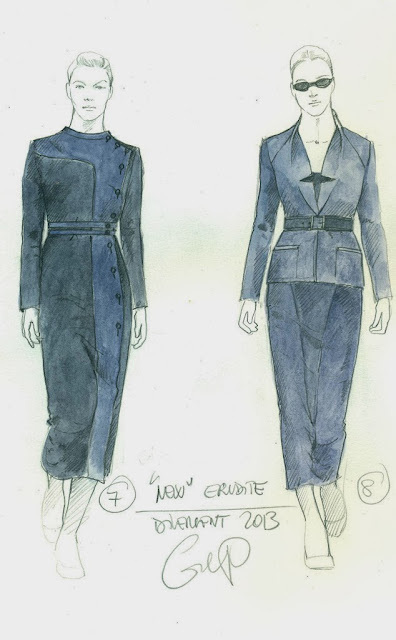 The fabrics are more techno than the others, and the costume cut is very sharp and shaped," he explains. As for the inspiration? "The idea for their costume came to us from the shape of a lab coat that we reinvented." Candor: "The Candor faction sees the world divided in light and darkness, true and false, so they wear clothes in black and white," says Carlo. "The cut is soft, the fabrics are simple and plain but always with details and stitches in contrast. 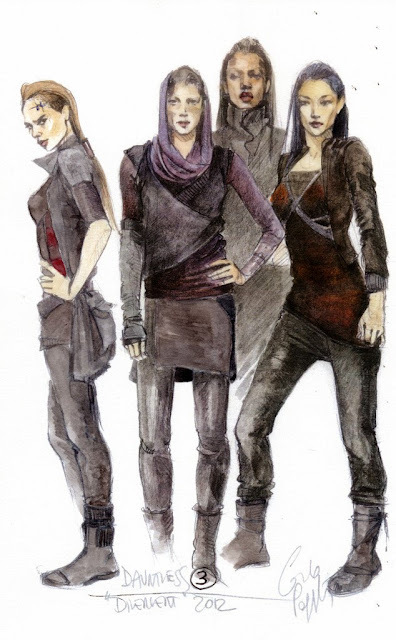 The men's jackets and the women's skirts are also shorter than the other factions." Amity: So what does the peaceful faction, otherwise known as Amity, wear? 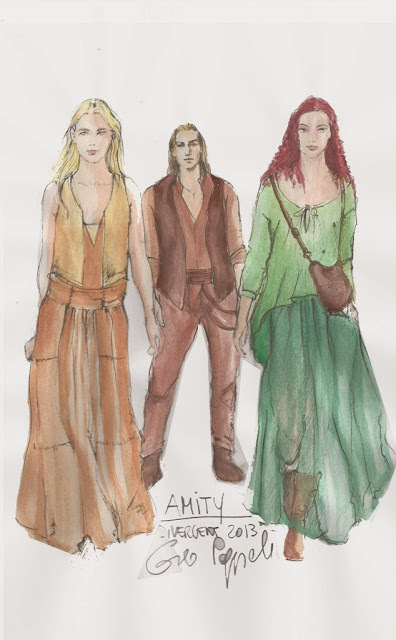 "Amity are farmers and produce food for all of the factions, so they wear natural earth colors like orange, dark red, a touch of green and brown," says Carlo. "The fabrics come from their fields, like cotton and linen. The cut is very practical and comfortable for working in the fields."